Rosicrucianism is a spiritual and cultural movement which arose in Europe in the early 17th century after the publication of several texts which purported to announce the existence of a hitherto unknown esoteric order to the world and made seeking its knowledge attractive to many. The mysterious doctrine of the order is allegedly "built on esoteric truths of the ancient past", which "concealed from the average man, provide insight into nature, the physical universe, and the spiritual realm." The manifestos do not elaborate extensively on the matter, but clearly combine references to Kabbalah, Hermeticism, alchemy, and mystical Christianity. The Rosicrucian manifestos heralded a "universal reformation of mankind", through a science allegedly kept secret for decades until the intellectual climate might receive it. Controversies have arisen on whether they were a hoax, whether the "Order of the Rosy Cross" existed as described in the manifestos, or whether the whole thing was a metaphor disguising a movement that really existed, but in a different form. In 1616, Johann Valentin Andreae famously designated it as a "ludibrium". Some esoteric scholars suggest that this statement was later made by Andreae in order to shield himself from the wrath of the religious and political institutions of the day, which were intolerant of free speech and the idea of a "universal reformation", which the manifestos called for. An example of the rosicrucian, rosy cross symbol predating the early rosicrucian manifestoes is that shown on the central panel of Herbaville Triptych, which is Byzantine and comes from the 10th or 11th century. The symbol is a Calvary cross with a rose in its centre, which is identical with what masonic/rosicrucian scholar, Manly Palmer Hall, claimed to be the original symbol of the rosicrucians. In his work "Silentium Post Clamores" (1617), rosicrucian, Michel Maier (1568–1622), described rosicrucianism as having arisen from a "Primordial Tradition" in the following statement: "Our origins are Egyptian, Brahmanic, derived from the mysteries of Eleusis and Samothrace, the Magi of Persia, the Pythagoreans, and the Arabs." By promising a spiritual transformation at a time of great turmoil, the manifestos influenced many figures to seek esoteric knowledge. 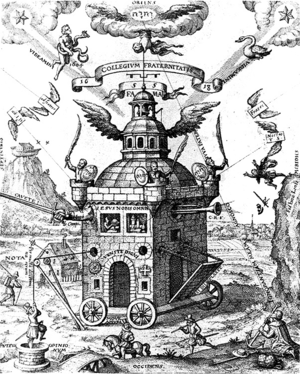 Seventeenth-century occult philosophers such as Michael Maier, Robert Fludd, and Thomas Vaughan interested themselves in the Rosicrucian world view. According to historian David Stevenson, it was influential to Freemasonry as it was emerging in Scotland. In later centuries, many esoteric societies have claimed to derive from the original Rosicrucians. Rosicrucianism is symbolized by the Rosy Cross or Rose Cross. The largest and most influential of these societies has been the Hermetic Order of the Golden Dawn, which consisted of several well known members of society. The other is the Rosicrucian Order, A.M.O.R.C, an international, initiatic Fraternity, which involves itself in several educational and cultural activities, worldwide. Between 1614 and 1617, three anonymous manifestos were published, first in Germany and later throughout Europe. These were the Fama Fraternitatis RC (The Fame of the Brotherhood of RC, 1614), the Confessio Fraternitatis (The Confession of the Brotherhood of RC, 1615), and the Chymical Wedding of Christian Rosicross a.D. MCCCCLIX (1617). The Fama Fraternitatis presents the legend of a German doctor and mystic philosopher referred to as "Father Brother C.R.C." (later identified in a third manifesto as Christian Rosenkreuz, or "Rose-cross"). The year 1378 is presented as being the birth year of "our Christian Father", and it is stated that he lived 106 years. After studying in the Middle East under various masters, possibly adhering to Sufism, he was unable to spread the knowledge he had acquired to prominent European scientists and philosophers. Instead, he gathered a small circle of friends/disciples and founded the Rosicrucian Order (this can be deduced to have occurred around 1407). During Rosenkreuz's lifetime, the order was said to comprise no more than eight members, each a doctor and a sworn bachelor. Each member undertook an oath to heal the sick, but without payment, to maintain a secret fellowship, and to find a replacement for himself before he died. Three such generations had supposedly passed between c. 1500 and c. 1600, a time when scientific, philosophical and religious freedom had grown so that the public might benefit from the Rosicrucians' knowledge, so that they were now seeking good men. It is evident that the first Rosicrucian manifesto was influenced by the work of the respected hermetic philosopher Heinrich Khunrath, of Hamburg, author of the Amphitheatrum Sapientiae Aeternae (1609), who was in turn influenced by John Dee, author of the Monas Hieroglyphica (1564). The invitation to the royal wedding in the Chymical Wedding of Christian Rosenkreutz opens with Dee's philosophical key, the Monas Hieroglyphica symbol. The writer also claimed the brotherhood possessed a book that resembled the works of Paracelsus. Adam Haslmayr a close friend of Karl Widemann (who collected Paracelsus' work), wrote him a letter about Rosicrucian people who revealed the Theophrastiam, on December 24, 1611. Their literature announced them as moral and religious reformers. 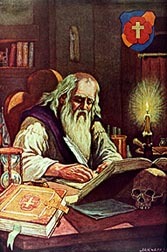 They used the techniques of chemistry (alchemy) and of the sciences generally as media through which to publicize their opinions and beliefs. In his autobiography, Johann Valentin Andreae (1586–1654) claimed that the anonymously published Chymical Wedding of Christian Rosenkreutz was one of his works, and he subsequently described it as a ludibrium. In his later works, he makes alchemy an object of ridicule and places it along with music, art, theater and astrology in the category of less serious sciences. According to some sources, his role in the origin of the Rosicrucian legend is controversial. However, it was generally accepted according to others. The peak of the "Rosicrucianism furore" was reached when two mysterious posters appeared on the walls of Paris in 1622 within a few days of each other. The first said "We, the Deputies of the Higher College of the Rose-Croix, do make our stay, visibly and invisibly, in this city (...)", and the second ended with the words "The thoughts attached to the real desire of the seeker will lead us to him and him to us." The legendary first manifesto, Fama Fraternitatis Rosae Crucis (1614), inspired the works of Michael Maier (1568–1622) of Germany; Robert Fludd (1574–1637) and Elias Ashmole (1617–1692) of England; Teophilus Schweighardt Constantiens, Gotthardus Arthusius, Julius Sperber, Henricus Madathanus, Gabriel Naudé, Thomas Vaughan and others. In Elias Ashmole's Theatrum Chimicum britannicum (1650) he defends the Rosicrucians. Some later works impacting Rosicrucianism were the Opus magocabalisticum et theosophicum by George von Welling (1719)—of alchemical and paracelsian inspiration—and the Aureum Vellus oder Goldenes Vliess by Hermann Fictuld in 1749. Michael Maier was appointed Pfalzgraf (Count Palatine) by Rudolf II, Holy Roman Emperor and King of Hungary and King of Bohemia. He also was one of the most prominent defenders of the Rosicrucians, clearly transmitting details about the "Brothers of the Rose Cross" in his writings. Maier made the firm statement that the Brothers of R.C. exist to advance inspired arts and sciences, including alchemy. Researchers of Maier's writings point out that he never claimed to have produced gold, nor did Heinrich Khunrath or any of the other "Rosicrucianists". Their writings point toward a symbolic and spiritual alchemy, rather than an operative one. In a combination of direct and veiled styles, these writings conveyed the nine stages of the involutive-evolutive transmutation of the threefold body of the human being, the threefold soul and the threefold spirit, among other esoteric knowledge related to the "Path of Initiation". In his 1618 pamphlet, Pia et Utilissima Admonitio de Fratribus Rosae Crucis, Henrichus Neuhusius wrote that the Rosicrucians departed for the east due to European instability caused by the start of the Thirty Years' War. In 1710, Sigmund Richter, founder of the secret society of the Golden and Rosy Cross, also suggested the Rosicrucians had migrated eastward. In the first half of the 20th century, René Guénon, a researcher of the occult, presented this same idea in some of his works. An eminent author of the 19th century, Arthur Edward Waite, presented arguments contradicting this idea. It was in this fertile field of discourse that many Rosicrucian societies arose. They were based on the occult, inspired by the mystery of this "College of Invisibles". Some modern scholars, for example Adam McLean and Giordano Berti, assume that among the first followers of the Rose Cross there was also the German theologian Daniel Cramer, that in 1617 published a bizarre treatise entitled "Societas Jesus et Rosae Crucis Vera" (The True Society of Jesus and the Rosy Cross), containing 40 emblematic figures accompanied by biblical quotations. —  Henry Adamson, The Muses' Threnodie (Perth, 1638). The idea of such an order, exemplified by the network of astronomers, professors, mathematicians, and natural philosophers in 16th-century Europe promoted by such men as Johannes Kepler, Georg Joachim Rheticus, John Dee and Tycho Brahe, gave rise to the Invisible College. 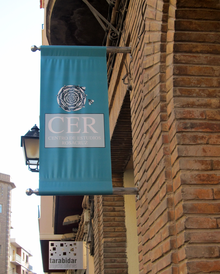 This was the precursor to the Royal Society founded in 1660. It was constituted by a group of scientists who began to hold regular meetings to share and develop knowledge acquired by experimental investigation. Among these were Robert Boyle, who wrote: "the cornerstones of the Invisible (or as they term themselves the Philosophical) College, do now and then honour me with their company...";John Wilkins and John Wallis, who described those meetings in the following terms: "About the year 1645, while I lived in London (at a time when, by our civil wars, academical studies were much interrupted in both our Universities), ... I had the opportunity of being acquainted with divers worthy persons, inquisitive natural philosophy, and other parts of human learning; and particularly of what hath been called the New Philosophy or Experimental Philosophy. We did by agreements, divers of us, meet weekly in London on a certain day and hour, under a certain penalty, and a weekly contribution for the charge of experiments, with certain rules agreed amongst us, to treat and discourse of such affairs..."
According to Jean Pierre Bayard, two Rosicrucian-inspired Masonic rites emerged toward the end of 18th century, the Rectified Scottish Rite, widespread in Central Europe where there was a strong presence of the "Golden and Rosy Cross", and the Ancient and Accepted Scottish Rite, first practised in France, in which the 18th degree is called Knight of the Rose Croix. The Gold und Rosenkreuzer (Golden and Rosy Cross) was founded by the alchemist Samuel Richter who in 1710 published Die warhhaffte und vollkommene Bereitung des Philosophischen Steins der Brüderschaft aus dem Orden des Gülden-und Rosen-Creutzes (The True and Complete Preparation of the Philosopher's Stone by the Brotherhood from the Order of the Golden and Rosy Cross) in Breslau under the pseudonym Sincerus Renatus in Prague in the early 18th century as a hierarchical secret society composed of internal circles, recognition signs and alchemy treatises. Under the leadership of Hermann Fictuld the group reformed itself extensively in 1767 and again in 1777 because of political pressure. 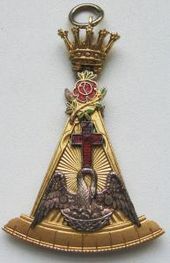 Its members claimed that the leaders of the Rosicrucian Order had invented Freemasonry and only they knew the secret meaning of Masonic symbols. The Rosicrucian Order had been founded by Egyptian "Ormusse" or "Licht-Weise" who had emigrated to Scotland with the name "Builders from the East". In 1785 and 1788 the Golden and Rosy Cross group published the Geheime Figuren or "The Secret Symbols of the 16th and 17th century Rosicrucians". After 1782, this highly secretive society added Egyptian, Greek, and Druidic mysteries to its alchemy system. A comparative study of what is known about the Gold and Rosenkreuzer appears to reveal, on the one hand, that it has influenced the creation of some modern initiatic groups and, on the other hand, that the Nazis (see The Occult Roots of Nazism) may have been inspired by this German group. According to Maurice Magre (1877–1941) in his book Magicians, Seers, and Mystics, Rosenkreutz was the last descendant of the Germelshausen, a German family from the 13th century. Their castle stood in the Thuringian Forest on the border of Hesse, and they embraced Albigensian doctrines. The whole family was put to death by Landgrave Conrad of Thuringia, except for the youngest son, who was then five years old. He was carried away secretly by a monk, an Albigensian adept from Languedoc, and placed in a monastery under the influence of the Albigenses, where he was educated and met the four Brothers later to be associated with him in the founding of the Rosicrucian Brotherhood. Magre's account supposedly derives from oral tradition. The Well of Initiation (27m high; 9 levels/strata) located in Quinta da Regaleira, Sintra, Portugal. It was built 1904 – 1910. At the bottom of the "well" is seen the Rose of the Winds (8-point compass rose: 4 cardinal and 4 ordinal directions) placed upon the Templar Cross (Cross pattée/Alisee: with the ends of the arms convex and curved, a variant used by the Knights Templar in Portugal): the Rose Cross. The Rosicrucian Fellowship, 1909 at Mount Ecclesia (groundbreaking for first building: 1911). Teachings present the mysteries, in the form of esoteric knowledge, of which Christ spoke in Matthew 13:11 and Luke 8:10. The Fellowship seeks to prepare the individual through harmonious development of mind and heart in a spirit of unselfish service to mankind and an all-embracing altruism. According to it the Rosicrucian Order was founded in 1313 and is composed of twelve exalted Beings gathered around a thirteenth, Christian Rosenkreuz. These great adepts have already advanced far beyond the cycle of rebirth. Their mission is to prepare the whole wide world for a new phase in religion, which includes awareness of the inner worlds and the subtle bodies, and to provide safe guidance in the gradual awakening of man's latent spiritual faculties during the next six centuries toward the coming Age of Aquarius. According to Masonic writers, the Order of the Rose Cross is expounded in a major Christian literary work that molded the subsequent spiritual beliefs of western civilization: The Divine Comedy (ca. 1308–1321) by Dante Alighieri. 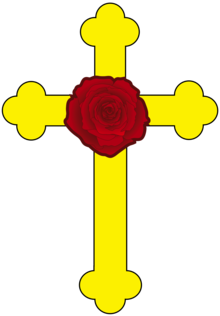 The Rose Cross Order, reestablished in Canary Islands, Spain in 1988. Many of these groups generally speak of a lineal descent from earlier branches of the ancient Rosicrucian Order in England, France, Egypt, or other countries. However, some groups speak of a spiritual affiliation with a true and invisible Rosicrucian Order. Note that there are other Rosicrucian groups not listed here. Some do not use the name "Rosicrucian" to name themselves. Some groups listed may have been dissolved and are no longer operating. Aesthetic Rose+Croix Order of the Temple and the Grail (L'Ordre de la Rose+Croix Esthétique du Temple et du Graal), reconstituted by l'Eglise Gnostique (Catholique) Apostolique, 2017. ^ Lindgren, Carl Edwin, The way of the Rose Cross; A Historical Perception, 1614–1620, archived from the original on 8 November 2012. Journal of Religion and Psychical Research, Volume 18, Number 3:141–48. 1995. ^ Philalethes, Eugenius (1997). Fame and Confession of the Fraternity of the Rosy Cross. City: Kessinger Publishing. p. 9ff. ISBN 1-56459-257-X. ^ Ole Peter Grell (1998). Paracelsus. p. 163. ^ See. Adam McLean (editor), The Rosicrucian Emblems of Daniel Cramer: The True Society of Jesus and the Rosy Cross (Edinburgh, 1991), and Giordano Berti (editor), The Sibyl of the Heart (Boves, 2015). ^ a b c d e f g h i j Frater Melchior. "Manifestations of the Neo-Rosicrucian Current"